The festival of Gudi Padwa is celebrated on the first day of the Chaitra month. The Maharashtrians celebrate the festival as a New Year. 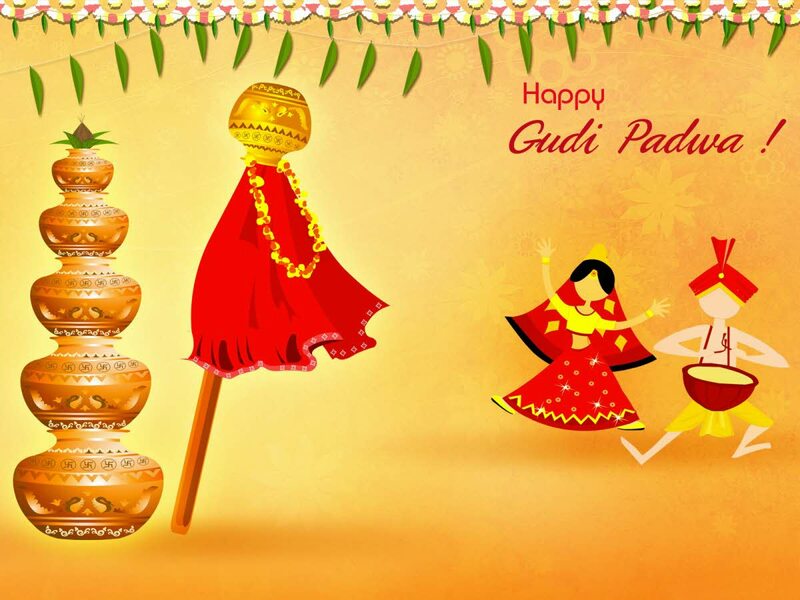 The Gudi Padwa is termed as the Ugadi festival in the states of Andhra Pradesh and Karnataka. The festival marks the beginning of the spring season. The word “Gudi” give the meaning Brahma's flag known as Brahmadhvaj. The flag is hoisted by the people on the day of Gudi Padwa. It denotes the symbol of victory of good over the evil. The people of the place have a belief that it leaves all the evil influences and brings prosperity and good luck into the house. Gudi is being made by tying a bright green or yellow cloth, adorned with brocade, to a long bamboo. Over the cloth, the gathi which is a kind of sweet, neem leaves, a twig of mango leaves and a garland of red flowers are tied together. A silver or copper pot is placed over it in an inverted position. After that the Gudi is hoisted on the window or maybe above the gate. The floor is placed with Rangoli, which is made of a special powder of soft, white stone. By the end they are worshipped and an offering is placed in obeisance to the flag of Lord Brahma. People around the world celebrate the festival full of spirit and joy. During the Gudi Padwa festival, the gudis are hung outside the houses. A 'gudi' is a pole on the top of which is an upturned brass or silver pot called a kalash. The gudi is covered with a colorful silk cloth and decorated with marigold flowers, coconuts, and mango leaves. The Gudi is worshipped by placing the sandalwood paste, turmeric and vermilion as an offering. The boys and the young men of the place form a pyramid shape and the person right on top of the pyramid breaks the coconut which is in the kalash. During the festival time, the day usually begins with the cleaning ritual where all the houses are kept well and fully cleaned. In the villages, the floors are covered and kept clean with cow dungs. The women and children indulge in the Rangoli, which is the drawing and coloring with lots of designs on the doorsteps of their homes. Lots of colourful Rangoli designs will be drawn by the women and children along the entrances of their homes and grounds. Children, men and women of the place, wear new clothes on that day. The Maharashtrian kind of food items and delicacies are prepared for everyone. Everyone of in the festival have soonth panak and chana usal, which would be the main specialties of the day. The Maharashtrians make puran poli or sweet roti’s also for the festival. On the festival day bittersweet leaves of the neem tree are eaten. A paste of crushed neem leaves, cumin seeds, jaggery and salt is taken before eating any food in the morning. People coming from different places gather together along with their family and friends.